Greatest Inspirational Travel Video - Italy! I'm Bojan from The Roman Guy. Today, we're going to teach you how to use the buses in Rome. This is our latest in the series of "Roma How To" videos. 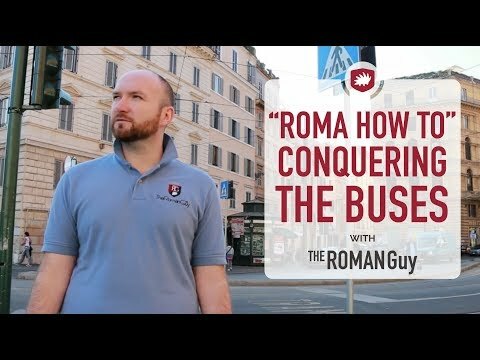 Now, in any foreign country, the transportation system can get pretty complicated, but today, we're going to show you how to conquer the buses of Rome. We recommend carrying a ticket with you while in Rome. You never know when you're going to need one and actually, it's really hard to find one on the bus. You usually get them at a Tabacchi place. Now let me show you how to actually buy one. Un biglietto del autobus per favore. Quant'e? When traveling around Rome, it's important that you know where you are, where you're going, and which bus number you're supposed to take. We're standing here on the bus stop in Piazza Venezia. The Italian word for bus stop is fermata. You'll read the fermata on top of the boards and also the name of that bus stop. In this case, Piazza Venezia. After that, it's important to choose which bus to take. Now, above the bus number, you'll always see a different letter, X meaning Express. Watch out, this bus doesn't stop at every single stop. Night bus is marked with the letter N and the ones you'll usually be looking for are the buses with the letter U, meaning urban. Our destination, in this case, is Piazza Navona. Now, usually on these bus stops, you'll not see the name Piazza Navona on the board, which means we need to look for the nearest stop available. This is when your map will come in handy. To get to Piazza Navona, we need to get off at Corso Vittorio Emanuele, which means, looking at your board in front of you, we're looking for the bus number 64. It's also important to notice that the first and the last stops are what's known as the Capolinea meaning the beginning and the end of your course. In order to get to Piazza Navona from Piazza Venezia, you'll have to take the bus number 64, heading into the direction of Stazione St. Pietro. Now that you're on the bus and the crowd is finally cleared out, you got to use your tickets. You have the arrow pointing out the place where you need to insert it into the machine. Check it out. That's it, validated. Everyone, we've reached our destination, the beautiful Piazza Navona. Now, you can admire Bernini's Four River Fountain. We hope this was helpful and make sure you check out our other "Rome How To" videos.